Lessons From Dead Dinosaurs : 13.7: Cosmos And Culture The violent demise of the dinosaurs can teach us a lesson or two about our place in the big scheme of things. Are we the end product of cosmic cataclysms? 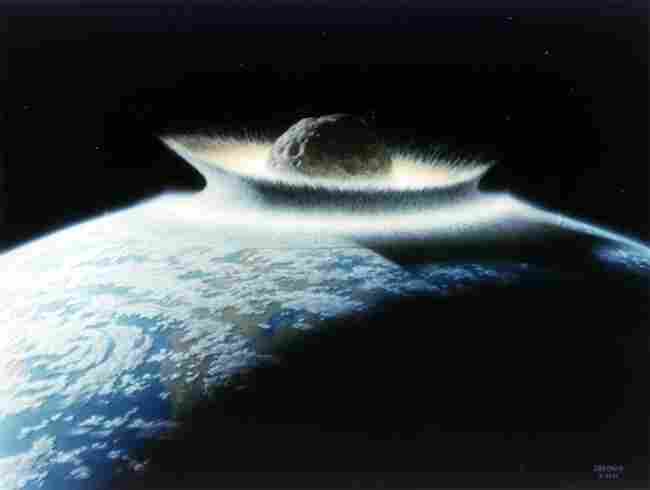 NASA says an impact with a 500-km-diameter asteroid would effectively sterilize the planet. Sometimes death comes from unexpected places. If you were a dinosaur living some 65 million years ago, your greatest fear was probably other dinosaurs; especially if you weren't a mighty meat-eater like the tyrannosaur, who had little to fear apart from, perhaps, other mighty meat-eaters. Yet, in spite of possible downward trends in some types of dinosaurs, what finished them off was a cosmic cataclysm of untold proportions, the collision with a six-mile wide asteroid. The impact left a 100-mile-wide crater off the coast of Mexico in the Yucatán peninsula. It's hard to imagine that a single impact could do so much damage. But doing the math, the collision with a rock that big traveling at about 20 miles per second (150 times faster than a jet airliner) would deposit as much energy as one-hundred-thousand times the energy that would have been produced by the detonating all the H-bombs that existed at the height of the Cold War. Apparently, the violence of the impact was such that the rebound shot debris half the distance to the moon. Dense clouds of dust blocked sunlight for months, causing the Earth's surface temperature to plummet. After the dust settled, greenhouse gases had the reverse effect. Temperatures to skyrocketed, going well above pre-impact levels. Over 50 percent of all living species died. This was not the only impact, or the most deadly. A list of impacts and their respective craters can be found on the Internet. Fortunately, all large impacts are quite old. The most recent one of note is the Tunguska Event of 1908, possibly an asteroid fragment about 120-feet across that blew up a couple of miles above the ground. It flattened a 20-mile-wide swath of Siberian pine forest. The energy released was equivalent to 185 Hiroshima bombs. Can something like this happen again? NASA's Near Earth Object Program attempts to map and estimate the impact risk of asteroids that come close to our cosmic neighborhood. Within their window of precision, we have nothing to fear in the short term, and certainly nothing to fear from really large objects, the so-called "global killers," such as the one that finished off the dinosaurs. Large comets and asteroids should be detectable a couple of years out from impact, giving us some time to prepare. Our response wouldn't be quite as spectacular as the operation in the blockbuster movie Armageddon. Instead, by sending an unmanned craft with explosive devices or attachable rockets, we could ease the threat into a new, non-impact orbit. I discuss some ways of dealing with possible impacts in my book The Prophet and the Astronomer. The rich history of cosmic collisions teaches us something important about life on Earth: had history been different, life would have taken a different course and we wouldn't be here. We owe our existence to massive cataclysmic events, random accidents that played a large role in determining the pace of evolution. As a consequence, we can state confidently that humans are unique in the cosmos. Even if intelligent life exists on some Earth-like planet in a distant corner of our galaxy, "they" will be very different from us. We are the products of our own planetary history, a history that hasn't and won't be duplicated anywhere else. The history of life on a planet mirrors the planet's life history. Since no two cosmic histories will ever be the same, we are unique in the universe; a good lesson to learn from dead dinosaurs, especially in days when you may not be feeling so important in the big scheme of things. You can keep up with more of what Marcelo is thinking on Facebook and Twitter.